Over the years I've made field boxes out of existing mostly tool boxes and while its worked it was never ideal. Now I'm back at the stage where I carry a bag with a box for lipos another for my transmitter and so on. I wanted to compile all the items back into a single field box but this time designing the whole thing from the ground up.. in 3D! 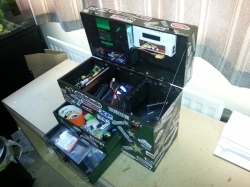 So while this box is a mere 40cm wide by 30cm tall and 18cm deep it contains 2 draws, a home for my transmitter, a storage area for lipo batteries and another for FPV and random items. While inside the actual lid will sit my charger, a 16000mAh 4S lipo to power my charger, a space for all wires and an empty area to sit batteries currently being charged. Thanks go to Acrylic Craft for the use of the laser cutters in my own time. Most recent: Desk dock 3D designed and laser cut for USB hub - phone cradle - SATA drive and car..
HPI Mini Recon Skyline conversation with adjustable turn buckles and suspension mod..
mypetbook.net The new social network site for pets - free and instant login with fa..